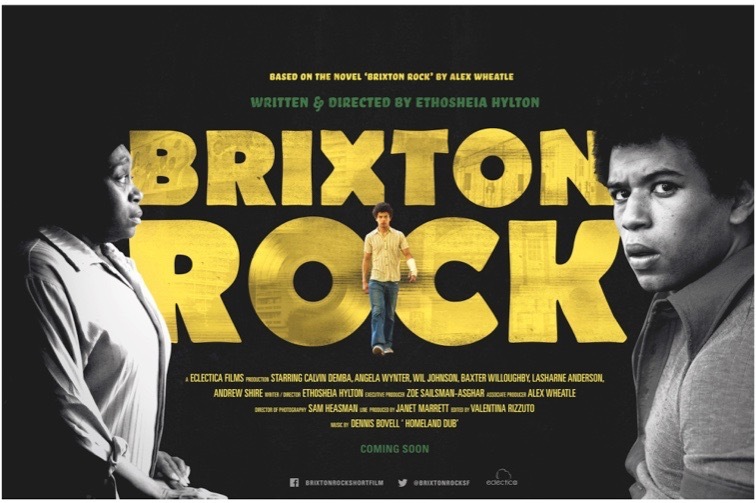 Last night I went to see Brixton Rock, the short film, based on Alex Wheatle’s novel of the same name. It was held in Brixton Library and apart from the title, and the location of the book, it was also there in the library that the first words of Brixton Rock were penned. One day they’ll have a plaque, if of course the library is still there, but that of course is another story. Brixton Rock was originally published in 1999 and tells the story of Brenton, a 16 year old boy who was abandoned by his parents and brought up in care. The story is set in Brixton, London during the 1980’s and highlights the emotional struggle of children who are raised within the social care system. In particular children who are from ethnic minority backgrounds. Brenton is of mixed racial heritage – white English and black Jamaican. The book eloquently portrays his emotional battle with abandonment, and his struggle to fit into society. Brixton Rock throws us back into a world filled with London slang and south London humour. It also incorporates a nostalgic 1980’s setting. Ethosheia Hylton, Writer/Director first came across the book a few years ago. Once she read it she was hooked and kept seeing the scenes in the novel as a feature film. She set about producing a script. The short has been produced as a taster of the full-length version. Alongside Ethosheia Hylton; Producer Zoe Sailsman-Asghar, and Production Manager Laurelle Blake, three incredibly talented women, got together to raise funds to start work on this much needed story. Last night we heard how they had been having problems casting Brenton Brown, the protagonist. That was until Calvin Demba turned up for audition. Calvin has been acting for a number of years including Hollyoaks, Youngers, (2013) and his latest Kingsman: The Golden Circle, out in September this year. Almost immediately, he became Brenton and made the role his own. At the beginning of the short, Brenton was given the address of his mother by his social worker, excellently performed by Andrew Shire. Brenton decides to go to her house and knocks unnanounced on the door. Her shock at seeing the son, who she perhaps feared and hoped would contact her, turned to tears as he became angry and violent. Her expressions spoke many words. Played by acting veteran, Angela Wynter, her moving performance made me think of the hardly mentioned black women who also had to give up their children in the 1950s/60s/70s. That is a story still to be told. The transition from adult Brenton to child Brenton was seamless, so much so that it’s only as I’m writing this and researching the actors, that I realise Baxter Willougby, played the young Brenton brilliantly. Juliette is played by Lasharne Anderson, an upcoming actress who appeared in the last scene, angry and shocked to be told Brenton is her brother. The script will be adapted to fit the film and one of these adaptations is around Brenton’s father, played by another acting veteran, Will Johnson. In the short, he appears in the scene just after Brenton is reunited with his mother, and meets his sister for the first time. I wondered what he was doing there. He wasn’t in that scene in the book! Unfortunately that was the end of the short, so I’ll have to wait for the full-length feature film to find out. Disaffected youth and lack of support for care leavers is frequently in the news, sometimes with devastating results. The lack of diversity in publishing and the film industry has too long been an issue. The story of being black and in care needs a narrative, the time for a film like Brixton Rock could not be better. Alex Wheatle (MBE) is the author of nine novels. His YA novel Liccle Bit was longlisted for the Carnegie Medal in 2016. “Wise as well as witty, understanding rather than blinkered, [Liccle Bit] is a joy to read” (Independent). In 2016 the second in the YA series, Crongton Knights won the 50th Guardian Children’s Fiction Prize. His first book, Brixton Rock (1999), tells the story of a 16-year old care leaver of mixed race, in 1980s Brixton. Its sequel, Brenton Brown, was published in 2011. In 2010, he wrote the one-man autobiographical performance, Uprising. Alex was awarded an MBE for services to literature in 2008.